In the Second Concerto I see Bach as coping with his pain and four hungry children while processing the grief of losing his wife, child and brother unexpectedly. The deepest despair endured not knowing the love of his life would be arriving in just a few months. Unrecorded are the people who helped feed and bathe the children, or who provided the liniments his aching heart and soul needed. I suspect it was the musicians in his orchestra and their families, but have no proof. The honorees in the 2nd Movement are people who taught me great lessons. They are a desperately poor young boy, whose name I do not know, who displayed integrity, honor and dignity equaling the highest levels I have ever seen; Martin Luther King - the greatest voice I ever heard; Joe Manning - who taught me the meanings of friendship and leadership; and Pythagoras, invented the most important formula in the history of mankind – the right angle and triangle (“a” squared plus “b” squared equals “c” squared). DaVinci ( painter, sculptor, architect, musician, mathematician, engineer, inventor, anatomist, geologist, cartographer, botanist, and writer) , Rembrandt and Vermeer are the great artists from this era who inspire me. And Voyager 1 is, of course, honored in connection with the 1st movement of the 2nd Concerto - the first music on Voyager's "Gold Record." 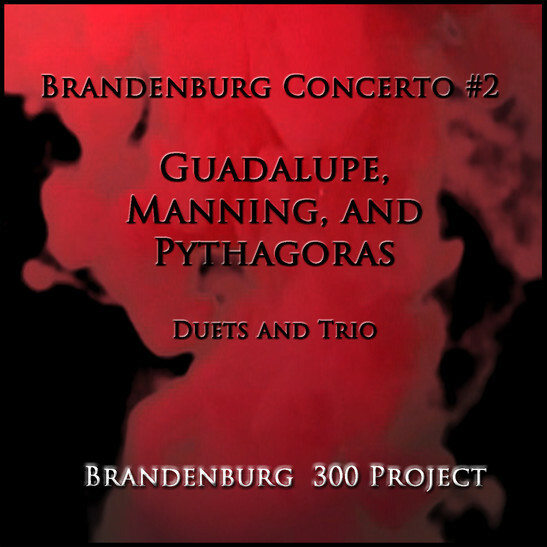 There are several versions of the 2nd Concerto recordings contained on the EP's: #2 Hybrids; #2 Trios and Duets; and Brandenburg 23 Six Variations. Two of the recordings on "Six Variations" were remixed and remastered. Brandenburg 23 Mike Miller became Brandenburg 23 Vermeer, and Brandenburg 23 Quartet became Brandenburg 23 DaVinci. 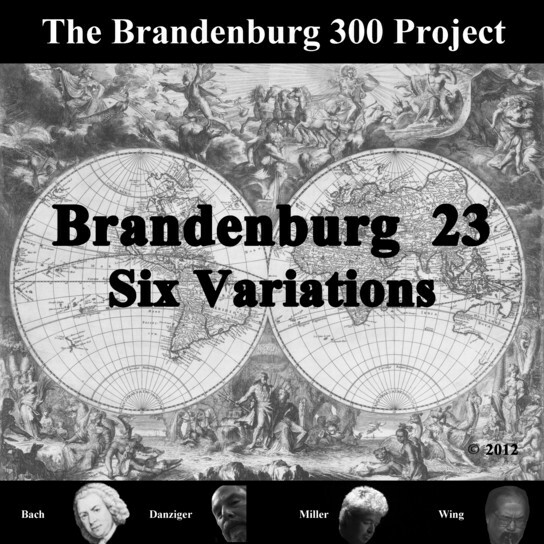 "Brandenburg 23: Six Variations" was the first album released by the Brandenburg 300 Project. Two pieces from that album were remixed and modified and included in later releases. Bob Danziger contains multitudes, but he does not contradict himself, as Walt Whitman boasted of doing. Bob is a gifted musician, composer, sound sculptor, inventor, author, entrepreneur, and a key player in the alternative energy industry for over thirty years. Recently, he has turned his all-embracing but fully consistent attention to adapting Bach's Brandenburg Concerto to his own unique "vision" - and the result does not merely bring the music up to date, but places it within all ages or eras with solid emphasis on our own, and the future. It's an ambitious undertaking, but one for which he possesses not just the vision and creative means to fulfill potential--but friends as well. Asked about the extent to which he may have taken liberties with Bach's original score, he replies with a single word, "Mucho." And he reminds me that, aside from improvising with his own musicians before ever delivering a score for the Brandenburg Concerto, the piece was never played in public during Bach’s lifetime. Consequently, Bob constructed his own score, based on the Eulenburg arrangement, and what we know of "the original" - and he rewrote large sections. Then, having recorded his own contribution to the actual music by way of synthesized or "sampled" combined English Horn and trombone interpretations, he enlisted the assistance of Albert Wing on soprano sax, clarinet and flute and Mike Miller on electric and acoustic guitar-both of whom have wildly impressive credentials that range from performing with everyone from Chick Corea, The Yellowjackets, Quincy Jones, Natalie Cole, and Frank Zappa to Diana Ross and Michael McDonald. These two musicians put in nearly thirty hours of freely improvised "work" on their own, in accord with what Bob had previously played himself; the material then shaped to twenty tracks by Miller and twelve by Wing. By way of multi-track recording techniques first explored by Les Paul and now refined to the point that one can pick and choose only the most favorable effects, the process afforded the three musicians "compositional and recording techniques not available to Bach." The three musicians have different backgrounds and experiences, and they created a unique "conversation" in which each could bring, free of inhibition, all that is best and unique in themselves to the music: jazz being close to the heart of Mike Miller, and Albert Wing also, but with a solid "touch" of South Dakota folk sensibility in his contribution. Since he himself has been on the ground floor, and courageously "out in space," for nearly every breakthrough technological development, Bob Danziger was able to make use of all resources available when it comes to producing "sound" at present. Speaking of his colleagues and himself, Bob says, "We've all been through what Bach went through while he was writing Brandenburg," and such experiences have been "internalizing in every way ... It's time for masters to be masters"-and I think that's what this trio of fine musicians became within this music-an incredible collaboration, producing combinations of sound never heard before. Just as Bach was highly inclusive himself (he not only produced the prolific "repertoire" that's been handed down to us, but also managed to "manufacture" twenty progeny! ), the results of Bob, Mike and Albert's efforts are amazingly inclusive-containing what the Russian poet Osip Mandelstam commended in Bach, whom he considered "a great debater," someone possessing "exuberant logic ... nourished by soul," if even a bit "stiff-necked" or petulant, someone capable of mixing his complaints with deserved praise. In other words, amazingly inclusive. 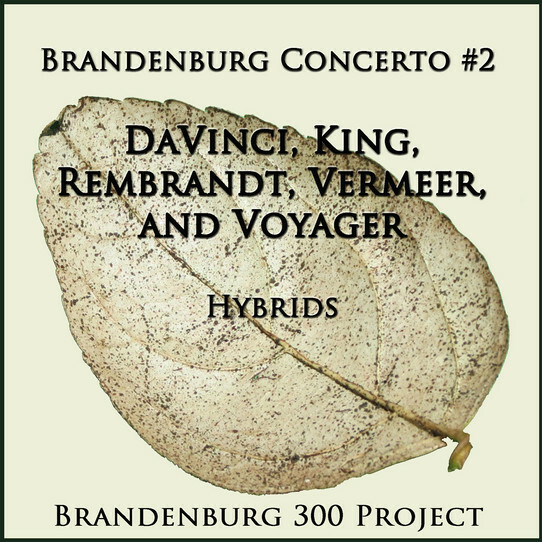 Bob Danziger's Brandenburg recording offers both horizontal and vertical mobility-the music unfolding or even sprouting at a joyous (occasionally breakneck) up tempo pace, but also disclosing layer upon layer of slowly absorbed meaning. I felt as if I were on some endlessly progressing trek or "trip," a voyage of discovery, an archaeological or spatial "dig" that eventually brought to light abundant unanticipated treasures and resultant wonder-an encyclopedic tapestry of texture and tone. Marcel Proust wrote about a musician whose piano performances were so that we, as listeners, are "no longer aware that the performer is a pianist at all," that the "apparatus of digital effort," all that "splattering shower of notes," drops out, and what we are left to experience is a performance "so transparent, so imbued with what he is interpreting, that one no longer sees the performer himself-he is simply a window opening upon a great work of art." All of the particulars, the parts, "flow into lakes of sound vaster than themselves." This is what I found happening to me as I listened to Bob Danziger's Brandenburg recording. If my own attempt to describe the effect tends to have become a bit "Baroque" itself, it's because the music I experienced became so delightfully diffuse yet in accord, so "epic" in its inclusiveness, so wild yet comforting in its "reach," so overwhelming with the full range of emotion it offered (from, yes, joy to sorrow to rage--and Bach himself was no stranger to rage! ), that I myself became "imbued with what [it was] interpreting," and for a few delightful, truly meaningful moments I felt a bit vaster than myself. Bill Minor is the author of Monterey Jazz Festival: Forty Legendary Years (with Clint Eastwood); Jazz Journeys to Japan: The Heart Within; and Unzipped Souls: A Jazz Journey through the Soviet Union. A jazz writer with over 150 articles to his credit--Down Beat, JazzTimes, Modern Drummer, Jazz Notes, Coda (Canada), Swing Journal (Japan), Jazz Forum (Poland), The Christian Science Monitor, and his jazz writing has also appeared online: jazzhouse.org, jazzinstituteofchicago.org, jazzwest.com, kyotojournal.org/10,000things.